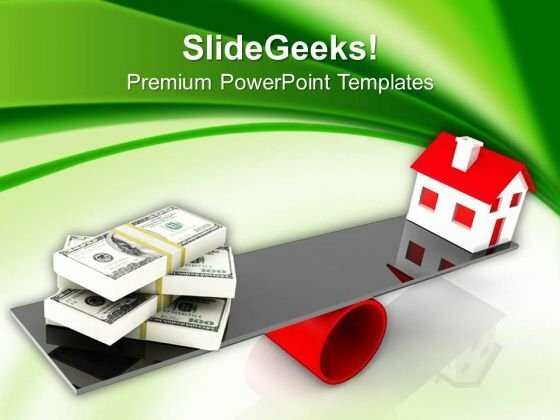 Real Estate And Dollar Concept Business PowerPoint Templates And PowerPoint Themes 1012-Use this Template to illustrate the strategy used in sales operation of land, property, real property, estate, realty, assets etc. It shows the Dollar and Home on the see-Saw illustrating the issue of increasing rates of house day by day. This Template portrays the concept of central, down home, familiar, family, homely, homey, household, in one's element, in the bosom, inland, internal, local, national, native etc.-Real Estate And Dollar Concept Business PowerPoint Templates And PowerPoint Themes 1012-This PowerPoint template can be used for presentations relating to-"Real Estate Dollar and House, Business, Money, Marketing, Finance, Sales" Plan for any extraneous factors with our Real Estate And Dollar Concept Business PowerPoint Templates And PowerPoint Themes 1012. Cater for them from all angles. Get the dynamics correct with our PT&s. Your thoughts will initiate the right moves.